Young Pipeline Professionals officers and work group members at the March kick off meeting formulate a plan for the launch of the organization. The oil and gas pipeline industry faces a looming crisis as baby boomers near retirement and leave behind a workforce shortage in their wake. Young professionals are needed as this “experience gap” is one of the main concerns brought up by industry veterans at such events as the Distribution Contractors Association (DCA) Annual Convention, the Pipeline Leadership Conference and others. Industry groups are working to combat this challenge through a number of avenues to help fill the ranks with the next generation of pipeline experts. One such group is the Young Pipeline Professionals USA (YPP USA), whose members are 35 years old or younger and working together within the industry “to prepare themselves to accept the transfer of the duty of care for the pipeline industry,” says Tara Podnar McMahan, chair of the association. The YPP USA formed in March 2015 and already has 82 members, 16 percent of which is represented by students, McMahan says. Although the group’s webpage (yppusa.org) shows an age limit, it doesn’t mean they’re barred from participating, adds Molly Laughlin, vice chair of YPP USA. o Educating young professionals about the pipeline industry, specifically on topics outside of their day to day roles. o Creating leadership opportunities for the next generation of pipeline professionals within YPP as well as in support of other industry organizations. o Fostering relationships and build a network for the betterment of the industry. o Be “awesome” — by constantly trying to improve our technical competency, contributing to the industry through standards development and other industry initiatives and never passing on an opportunity to learn from industry subject matter experts. McMahan and Laughlin sat down to answer a number of questions regarding the YPP USA, its goals as an organization and the impact of trends in the oil and gas pipeline industry. The following is a transcript of that conversation. How does the YPP USA go about recruiting members? McMahan: YPP USA is using a bit of a passive approach. We are attending conferences, holding networking events and conducting technical webinars to let the industry know who we are and what we are trying to accomplish and those who are interested are invited to join our cause. Laughlin: So far this year we have been at the Southern Gas Association Operating Conference and The Gas Machinery Conference. We will start 2016 off with Clarion’s Pipeline Pigging and Integrity Management Conference in Houston. Social media efforts have helped us keep people informed as well as our member management platform. What’s your “elevator pitch” for why the pipeline is industry an attractive career? McMahan: The pipeline industry is an attractive career because it is always changing and new challenges are always presenting themselves. The industry is largely regulated and prescriptive and does offer some stability despite commodity prices. Laughlin: A career in pipelines is incredibly rewarding. Each and every day you get to go to work and know you are either operating a pipeline, selling a product or working on a task to keep the hidden infrastructure underneath the ground safe and efficient. Public safety and the environment depend on pipeline professionals to do their jobs well. We have a responsibility to the public and our companies to do our jobs well. We do something that makes a difference and keeps the world running. How do down years and low commodity prices impact recruitment efforts? McMahan: During down years and low commodity prices, pipeline personnel are expected to do more with less. It is anticipated YPP USA could see a potential increase in membership as young pipeline professionals seek out opportunities to become more efficient and share ideas to address their challenges in new and innovative ways. YPP USA recruitment efforts will likely not be changed. Laughlin: I think the downturn in commodity prices offers the pipeline community a real chance to attract some amazing talent. With my company I am seeing it at a university level with our recruiting efforts and in YPP we are seeing it at a professional level. Engineers and support staff we would normally see on Exploration and Production projects are suddenly available to come to the midstream segment of the industry. This means YPP has an opportunity to attract members and help them learn about the technical aspects of pipelines right away. Employers see YPP as a great training ground. How do you go about fostering leadership opportunities for younger members of the pipeline industry? McMahan: Within YPP USA itself, there are many opportunities for young professionals to take leadership roles: one can serve as an officer or a work group leader. Additionally, industry organizations are reaching out to YPP USA as a volunteer pool of young professionals for leadership opportunities. What is the importance of building a network like the YPP? 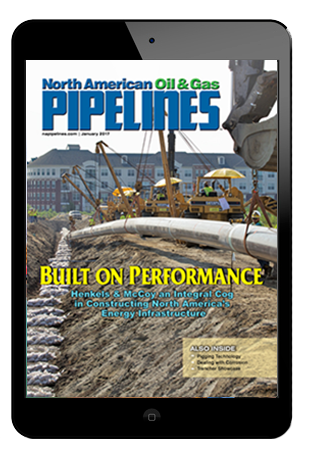 McMahan: YPP USA hopes to bridge the experience gap within the pipeline industry and position its young professionals as best as possible to accept the duty of care for the pipeline industry. If not prepared to accept the duty of care, the industry could lose precious time and resources making up for lost knowledge and experience. Laughlin: The professionals who are approaching retirement age have this amazing network of colleagues and professional relationships at a variety of companies. They have seen the upturns and downturns of the industry for years and many have worked together at one time or another. Young people do not have that. YPP encourages employers to see the benefits of building a professional network. Technical questions and best practices can be shared and the industry is better off as a whole if we educate and collaborate together. What can the pipeline industry do to better retain its younger workers? McMahan: Managers within the pipeline industry must adapt to the needs and expectations of the millennials entering the workforce. By the same token, the millennials must adapt to a conservative industry such as pipelines. If managers and millennials are able to adapt to one another and leverage one another’s strengths, retention shouldn’t be a problem. What is your advice to younger professionals who want to advance their career in the pipeline industry? McMahan: The pipeline industry is vast in its technical, operational and logistical challenges often requiring years of experience just to understand. Never turn down an opportunity to learn or experience something new, despite the personal sacrifice required. Laughlin: My advice is taken from my father who also works in pipelines. He always tells me the way to advance is to go to work every day and do the best you can. People notice when you are doing a good job. It may be people in your company that notice or it may be those outside that notice. Opportunity will find you if you are excelling at whatever you are doing. You just have to be receptive to it and take advantage of every chance to learn. Never say no to a chance to learn something new in pipelines because you never know who is watching. Those interested in learning more about the Young Pipeline Professionals USA can visit yppusa.org, subscribe to the group’s mailing list or follow them on LinkedIn for the most up to date information.